Solving the second part to the projectile motion problem (with wind gust) using ordered set vector notation. This video, which is suitable for high school students, starts with a black screen because the instructor, in his conversational tone, uses it as a 'chalkboard.' Instructor uses different colors for clarification. Lingustics major Lisa is #UMassProud that the university contributed almost $2 billion to the Massachusetts economy in 2013. This is an advanced course that aims to build vocabulary competence and improve oral communication through the study and discussion of topics related to cultural aspects in Lusophone societies, primarily from current issues in Brazil. It is designed to give students extensive experience in Portuguese and emphasizes skill development and refinement in the area of critical reading and writing in Portuguese. 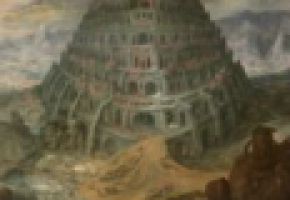 Author(s): Arditi, Aries and Gillman, Arthur E.
Enkele invulbladen rond het verhaal 'de toren van Babel'. Deze kan je laten maken nadat je het verhaal voorgelezen hebt uit een kinderboek met Bijbelverhalen.